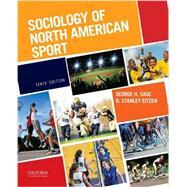 Now in its tenth edition, Sociology of North American Sport offers a compact yet comprehensive and integrated perspective on sport in North American society. Bringing a unique viewpoint to the subject, George H. Sage and D. Stanley Eitzen analyze and, in turn, demythologize sport. This method promotes an understanding of how a sociological perspective differs from common-sense perceptions about sport and society, helping students to understand sport in a new way. D. Stanley Eitzen is Professor Emeritus of Sociology at Colorado State University. Can Substance Abuse in Sports Be Reduced, Even Prevented? What Do Young Athletes, Their Parents, and Coaches Want from Sports? A Radical Question: Are Owners Necessary?